Jill Reese |DOT&PF Oct 19, 2015. (Anchorage)—State dignitaries cut the ribbon on the new Aleknagik Wood River Bridge last week, officially opening the structure to traffic. The bridge connects Aleknagik to the greater Dillingham area, increasing transportation safety in the community and linking residents to schools, businesses and the airport. City of Aleknagik Mayor Jane Gottschalk, Alaska State Senator Lyman Hoffman and Alaska State Representative Bryce Edgmon joined the Department of Transportation & Public Facilities Commissioner (DOT&PF) Marc Luiken in the ceremony earlier this week. 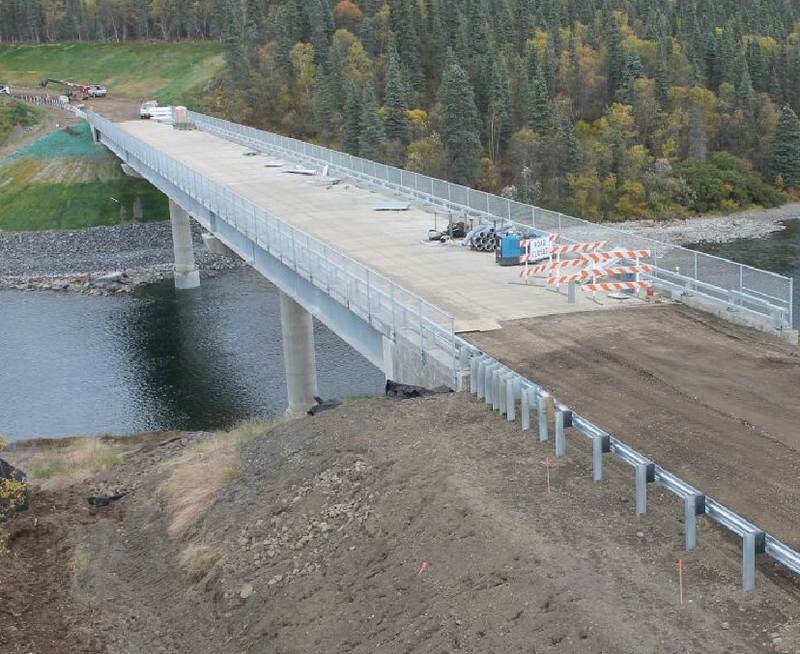 “The Aleknagik community divided by a river is finally connected!” said Jim Amundsen, DOT&PF highway design chief. The bridge has been a high priority of the Village of Aleknagik for many years. The community, located on both sides of the Aleknagik Lake, had to rely on boats and snow machines to travel within the area. Poor weather could make the trip treacherous, and fatalities have resulted from capsizing boats and breaking ice. The project includes a 2.5 mile approach road from the Dillingham Aleknagik Road to Peter Krause Sr. Drive in the Village of Aleknagik. The roadway is paved and has two 10 foot lanes with five foot shoulders. The two-lane bridge is over 400 feet long and has 40 feet of clearance above the river. The project was completed in two phases, and construction began in spring 2014. The $19 million project was built by Mowat Construction.